Welcome to the world of microservices, where continuous deployment isn’t just an aspiration, but a reality. With microservices, you can ditch the complexities of monolithic architecture for the nimble and flexible approach that embraces the “do one thing, and do it well” mentality. 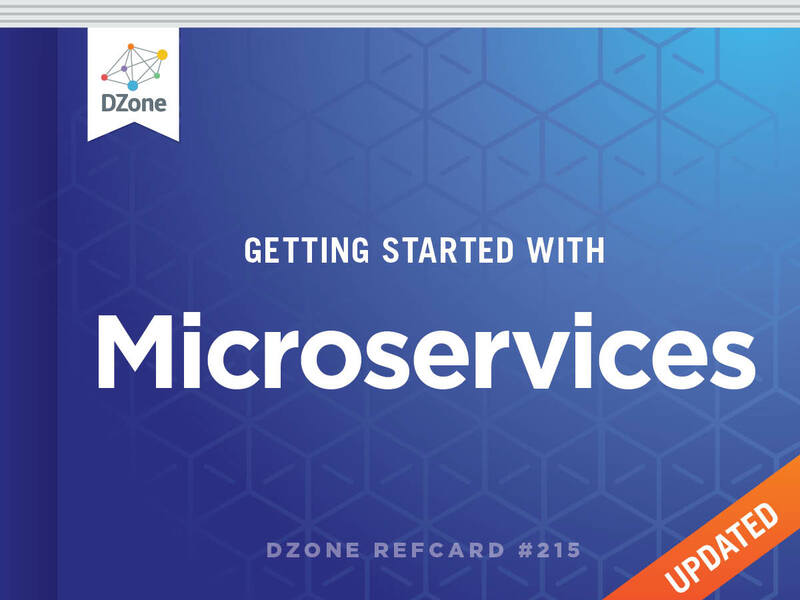 In this updated Refcard, you will learn why microservices are becoming the cornerstone of modern architecture, how to begin refactoring your monolithic application, and common patterns to help you get started. The term “microservices” describes a new software development pattern that has grown from recent trends in software development/management practices meant to increase the speed and efficiency of developing and managing software solutions. Agile methods, DevOps culture, PaaS, application containers, and the widespread adoption (both culturally and technically) of CI/CD methods across the marketplace are making it possible to consider building truly modular large-scale service systems for both internal and commercial use. Microservices involve an architectural approach that emphasizes the decomposition of applications into single-purpose, loosely coupled services managed by cross-functional teams, for delivering and maintaining complex software systems with the velocity and quality required by today’s digital business. Microservices are language-, platform-, and operating system- agnostic. They break down a big monolithic application, typically packaged as a single archive, into smaller and simpler applications. Each application does one thing, and does it well, so the “micro” in microservices refers to the scope of the services’ functionalities, as opposed to the number of Lines of Code (LOC). Each application is built by a full-stack team, which reduces potential communication mismatch between different teams that could exist otherwise. Microservices may not be suitable for simpler applications and are better suited for complex applications that have grown over a period of time. The availability of an application on a mobile device; the frequency with which an application needs to be updated; and the responsiveness of an application’s design are a few key factors driving this style of architecture. The concept behind microservices is similar to Service-oriented Architecture (SOA), which is why this style of architecture has been referred to as “SOA with DevOps,” “SOA for hipsters,” and “SOA 2.0”. Domain-Driven Design: Functional decomposition can be easily achieved using Eric Evans’s DDD approach. Single Responsibility Principle: Each service is responsible for a single part of the functionality, and does it well. Explicitly Published Interface: A producer service publishes an interface that is used by a consumer service. Independent DURS (Deploy, Update, Replace, Scale): Each service can be independently deployed, updated, replaced, and scaled. Lightweight Communication: REST over HTTP, STOMP over WebSocket, and other similar lightweight protocols are used for communication between services. Independent scaling: Each microservice can scale independently via X-axis scaling (cloning with more CPU or memory) and Z-axis scaling (sharding), based upon their needs. This is very different from monolithic applications, which may have very different requirements that must be deployed together. Independent upgrades: Each service can be deployed independent of other services. Any change local to a service can be easily made by a developer without requiring coordination with other teams. For example, performance of a service can be improved by changing the underlying implementation. As a result this maintains the agility of the microservice. This is also a great enabler of CI/CD. Easy maintenance: Code in a microservice is restricted to one function and is thus easier to understand. IDEs can load the smaller amounts of code more easily, and increased readability can keep developers more productive. Potential heterogeneity and polyglotism: Developers are free to pick the language and stack that are best suited for their service. This enables one to rewrite the service using better languages and technologies as opposed to being penalized because of past decisions, and gives freedom of choice when picking a technology, tool, or framework. Fault and resource isolation: A misbehaving service, such as a memory leak or an unclosed database connection, will only affect that service, as opposed to an entire monolithic application. This improves fault isolation and limits how much of an application a failure can affect. Improved communication across teams: A microservice is typically built by a full-stack team. All members related to a domain work together in a single team, which significantly improves communication between team members, as they share the same end goal. Microservices are not the silver bullet that will solve all architectural problems in your applications. Implementing microservices may help, but that is often just the byproduct of refactoring your application and typically rewriting code using guidelines required by this architecture style. True success requires significant investment. Service Replication: Each service needs to replicate, typically using X-axis cloning or Y-axis partitioning. There should be a standard mechanism by which services can easily scale based upon metadata. A PaaS, such as OpenShift by Red Hat, can simplify this functionality. Service Discovery: In a microservice world, multiple services are typically distributed in a PaaS environment. Immutable infrastructure is provided by containers or immutable VM images. Services may scale up and down based upon certain pre-defined metrics. The exact address of a service may not be known until the service is deployed and ready to be used. The dynamic nature of a service’s endpoint address is handled by service registration and discovery. Each service registers with a broker and provides more details about itself (including the endpoint address). Other consumer services then query the broker to find out the location of a service and invoke it. There are several ways to register and query services such as ZooKeeper, etcd, consul, Kubernetes, Netflix Eureka, and others. Service Monitoring: One of the most important aspects of a distributed system is service monitoring and logging. This enables one to take proactive action if, for example, a service is consuming unexpected resources. The ELK Stack can aggregate logs from different microservices, provide a consistent visualization over them, and make that data available to business users. Other possible tools for distributed logging are Syslog, Logentries, and Loggly. Resiliency: Software failure will occur, no matter how much and how hard you test. This is all the more important when multiple microservices are distributed all over the Internet. The key concern is not “how to avoid failure” but “how to deal with failure.” It’s important for services to automatically take corrective action to ensure user experience is not impacted. The Circuit Breaker pattern allows one to build resiliency in software—Netflix’s Hystrix and Ribbon are good libraries that implement this pattern. DevOps: Continuous Integration and Continuous Deployment (CI/CD) are very important in order for microservices-based applications to succeed. These practices are required so that errors are identified early, and so little to no coordination is required between different teams building different microservices. Consider a Java EE monolithic application that is typically defined as a WAR or an EAR archive. The entire functionality for the application is packaged in a single unit. For example, an online shopping cart may consist of User, Catalog, and Order functionalities. All web pages are in the root of the application, all corresponding Java classes are in the WEB-INF/classes directory, and all resources are in the WEB-INF/classes/META-INF directory. The above application is functionally decomposed where User, Order, and Catalog components are packaged as separate WAR files. Each WAR file has the relevant web pages, classes, and configuration files required for that component. Java EE is used to implement each component, but there is no long term commitment to the stack, as different components talk to each other using a well-defined API. Different classes in this component belong to the same domain, so the code is easier to write and maintain. The underlying stack can also change, possibly keeping technical debt to a minimum. Each archive has its own database (i.e. data stores are not shared). This allows each microservice to evolve and choose whatever type of data store—relational, NoSQL, flat file, in- memory, or some thing else—is most appropriate. Each component registers with a Service Registry. This is required because multiple stateless instances of each service might be running at a given time, and their exact endpoint locations will be known only at the runtime. Netflix Eureka, etcd, and Zookeeper are some options for service registry/ discovery. If components need to talk to each other, which is quite common, then they would do so using a pre-defined API. REST for synchronous or Pub/Sub for asynchronous communication are the most common means to achieve this. In this case, the Order component discovers User and Catalog service and talks to them using a REST API. More details can be found at: http://github.com/arun-gupta/microservices. Bounded contexts (a pattern from domain-driven design) are a great way to identify what parts of the domain model of a monolithic application can be decomposed into microservices. In an ideal decomposition, every bounded context can be extracted out as a separate microservice, which communicates with other similarly-extracted microservices through well defined APIs. It is not necessary to share the model classes of a microservice with consumers; the model objects should be hidden as you wish to minimize binary dependencies between your microservices. The use of an anti-corruption layer is strongly recommended during the process of decomposing a monolith. The anti-corruption layer allows the model in one microservice to change without impacting the consumers of the microservice. In a typical monolith, one team is responsible for developing and maintaining the frontend. With a microservices-architecture, multiple teams would be involved, and this could easily grow into an unmanageable problem. This could be resolved by componentizing various part of the frontend so that each microservice team can develop in a relatively isolated manner. Each microservice team will develop and maintain it's own set of components. Changes to various parts of the frontend are encapsulated to components and thus do not leak into other parts of the frontend. The frontend, acting as a client of microservices, may fetch data from several different microservices. Some of these microservices may not be capable of responding to protocols native to the web (HTTP+JSON/XML), thus requiring translation of messages from one protocol into another. Concerns like authentication and authorization, request-response translation among others can be handled in a centralized manner in a facade. Consider using an API Gateway, which acts as a facade that centralizes the aforementioned concerns at the network perimeter. Obviously, the API Gateway would respond to client requests over a protocol native to the web, while communicating with underlying microservices using the approach preferred by the microservices. Clients of microservices may identify themselves to the API Gateway through a token-authentication scheme like OAuth. The token may be revalidated again in downstream microservices to enforce defense in depth. Unlike a monolithic application, which can be designed to use a single database, microservices should be designed to use a separate logical database for each microservice. Sharing databases is discouraged and is an anti-pattern, as it forces one or more teams to wait for others, in the event of database schema updates; the database essentially becomes an API between the teams. One can use database schemas or other logical schemes to create a separate namespace of database objects, to avoid the need to create multiple physical databases. Additionally, one should consider the use of a database migration tool like Liquibase or Flyway when migrating from a monolithic architecture to a microservices architecture. The single monolithic database would have to be cloned to every microservice, and migrations have to be applied on every database to transform and extract the data appropriate to the microservice owning the database. Not every object in the original database of the monolith would be of interest to the individual microservices. Each microservice can in theory utilize its own technology stack, to enable the team to develop and maintain it in isolation with few external dependencies. It is quite possible for a single organization to utilize multiple runtime platforms (Java/JVM, Node, .NET, etc.) in a microservices architecture. This potentially opens up problems with provisioning these various runtime platforms on the datacenter hosts/nodes. Consider the use of virtualization technologies that allow the tech stacks to be packaged and deployed in separate virtual environments. To take this further, consider the use of containers as a lightweight-virtualization technology that allows the microservice and its runtime environment to be packaged up in a single image. With containers, one forgoes the need for packaging and running a guest OS on the host OS. Following which, consider the use of a container orchestration technology like Kubernetes, which allows you to define the various deployments in a manifest file, or a container platform, such as OpenShift. The manifest defines the intended state of the datacenter with various containers and associated policies, enabling a DevOps culture to spread and grow across development and operations teams. Microservices architectures are renowned for being eventually consistent, given that there are multiple datastores that store state within the architecture. Individual microservices can themselves be strongly consistent, but the system as a whole may exhibit eventual consistency in parts. To account for the eventual consistency property of a microservices architecture, one should consider the use of an event-driven architecture where data-changes in one microservice are relayed to interested microservices through events. A pub-sub messaging architecture may be employed to realize the event-driven architecture. One microservice may publish events as they occur in its context, and the events would be communicated to all interested microservices, that can proceed to update their own state. Events are a means to transfer state from one service to another. One may start off using integration testing to verify the correctness of changes performed during development. This is, however, an expensive process, since it requires booting up a microservice, the microservice’s dependencies, and all the microservice’s consumers, to verify that changes in the microservice have not broken the expectations of the consumers. This is where consumer-driven contracts aid in bringing in agility. With a consumer-driven contract, a consumer will declare a contract on what it expects from a provider. The microservices architectural style has well known advantages and can certainly help your business evolve faster. But monoliths have served us well and will continue to work for years to come. Consider the operational requirements of microservices in addition to the benefits before refactoring your monolith to a microservices architecture. Many times, better software engineering, organizational culture, and architecture will be enough to make your monoliths more agile. But, if you decide to follow the microservice route, then the advice in this Refcard should help to get you started.